( sub=almost + -caerul = blue + -escens = becoming ). 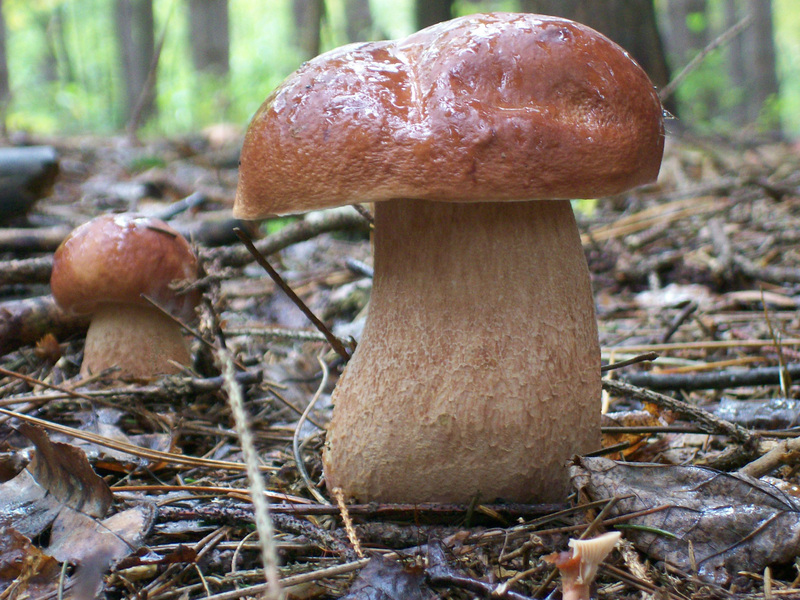 A long time ago I used to brag, in jest of course, to fellow mushroom lovers whenever I found a bunch of these saying something like ' Wow did I get a bunch of Porcini's today', or ' Last week I picked 20 pounds of King Boletes'. Of course back then it was proper to call them that, even though a subspecies. Alas, bragging now that I found 15 pounds of Almost Bluing King's does not have the same effect. Notwithstanding that the taxonomists made it less fun, the finding, picking and eating is still a great joy. They are still Porcini to me. Actually I consider them Steinpilze more then Porcini because in my youth I used to go with my grandfather to the Black Forest and pick those, all surrounded by pine, which these are generally found in ( big spruce here in my area ) so these, which are so similar, remind me of those old days. Why are they Almost Bluing? Because when the pore surface is bruised the bruise slowly almost becomes bluish. The color change stops though when it is almost blue, ending as a grayish blue ( sort of like a Payne's gray on some specimens ) then after about 25 minutes the bluish/gray bruise turns to brownish. The upper photo shows the bluish/gray bruise. The photo below shows that same bruise that has transformed to brownish after approximately 25 minutes. Cap is brownish red, sometimes slightly less intense. 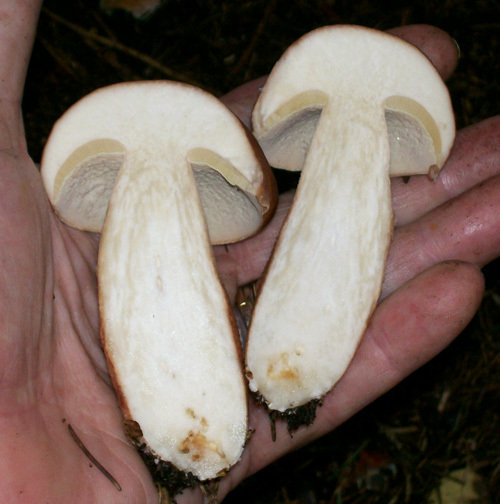 Often the cap will be incurved when young. Also you will often see some wrinkling on the cap surface. 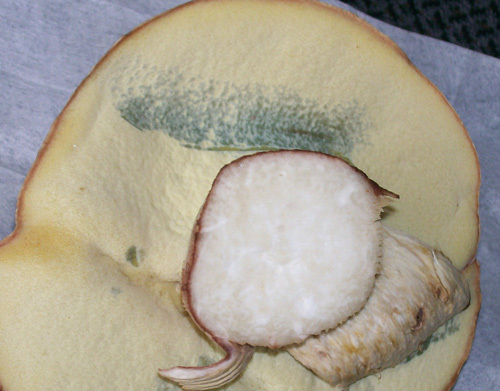 Pore surface, when young, is cream white. Good eating specimens are solid. Leave the ones that are not solid as a rock. Indeed, the German name - Steinpilz - literally translates to 'stone mushroom', that is, hard as a stone ( just a bit of hyperbole ). Stalk has reticulations, that is, a fishnet like network covering the stalk surface. 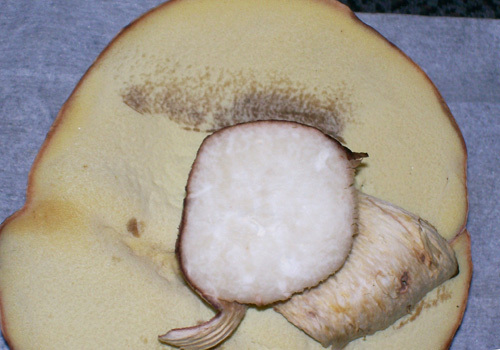 The reticulations will be brownish near the bottom becoming whitish as you go toward the top. The base color on the stalk will often contain some pinkishness. As the pores mature they start their transformation to darker cream, yellowish, yellowish olive, olive and then brownish olive. 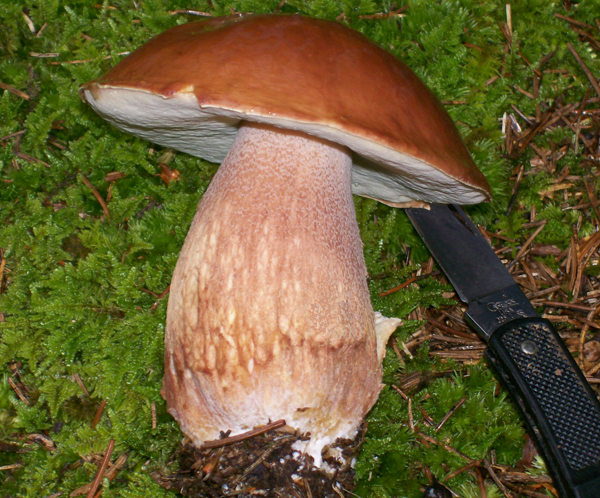 Boletus subcaerulescens can become huge with cap sizes approaching 12 inches or more. 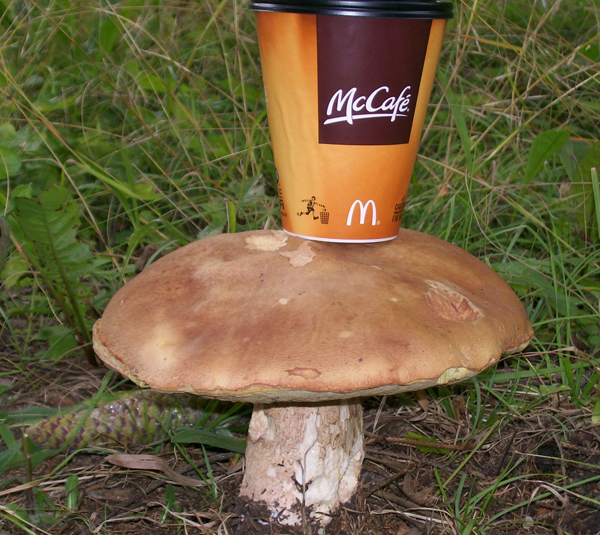 As the mushroom matures the cap color lightens quite a bit to a light brown. Don't eat the big ones. 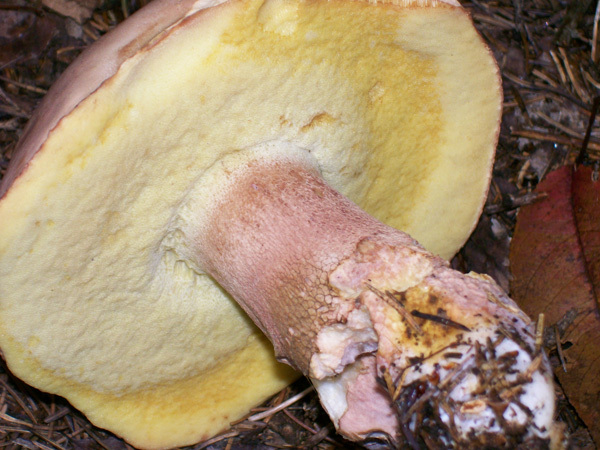 Just as in most Boletus edulis complex varieties the actual flesh of the mushroom is proportionately in more prominence than the pore layer, even in mature specimens where the pores are turning yellow, like the photo below. 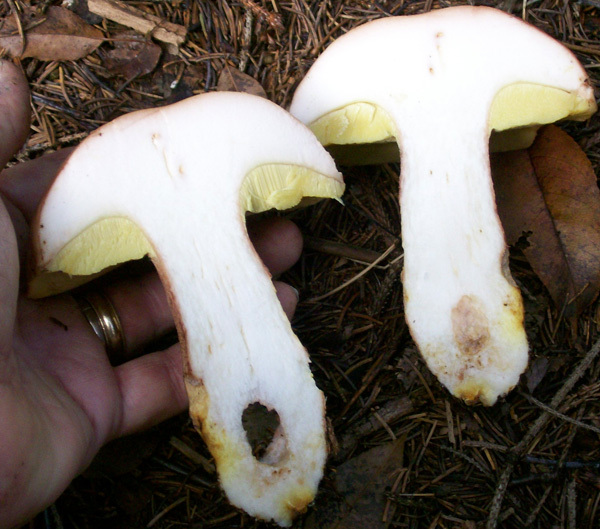 Flesh in the stem and cap is whitish. When young, like photo below demonstrates, there will be some mottling. There is no color change when cut or bruised. I have been finding these for years in stands of old growth Norway Spruce. When the conditions are right they will be popping out on droves. One or two places I go to actually produce so many that I get tired of picking and trimming. 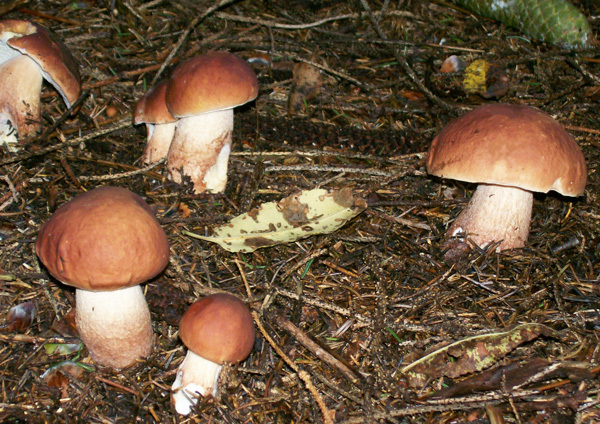 Here is a great photo I took of Boletus subcaerulescens. It makes a real good 'Background' for a computer's desktop. Help yourself. 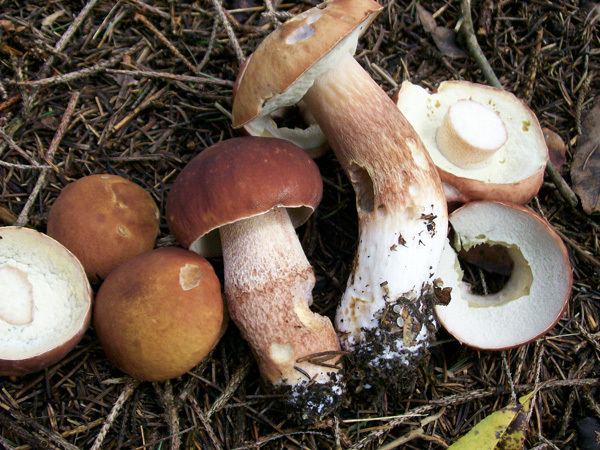 Boletus subcaerulescens - A/K/A - Boletus edulis ssp. 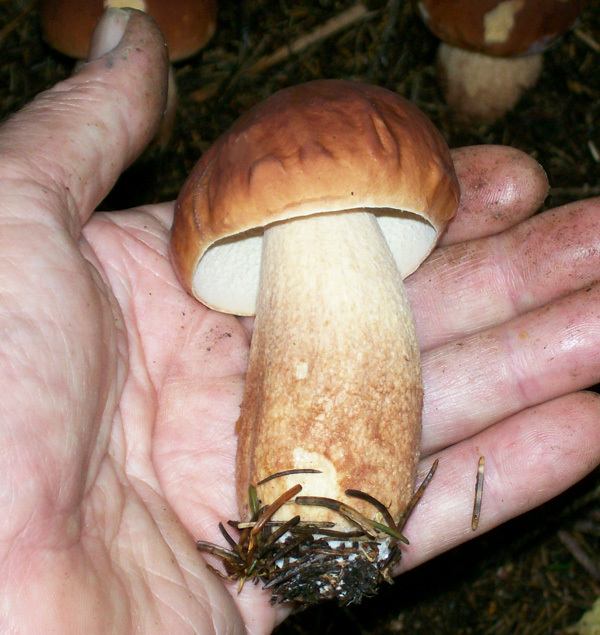 subcaerulescens, Almost Bluing Boletus edulis, Almost Bluing King Bolete. DATE - Mid August through October. FOUND - In spruce stands. I prefer old growth Norway Spruce but that's a personal thing. They don't have to be large tracts of spruce. Small stands here and there work just fine. Wet weather conditions in late Summer and Fall is ideal. I incorporate the Golden Chanterelle season ( Late July through August ) with these fine edibles and then again when the Hen of the Woods usually begin ( Late August to late September ). 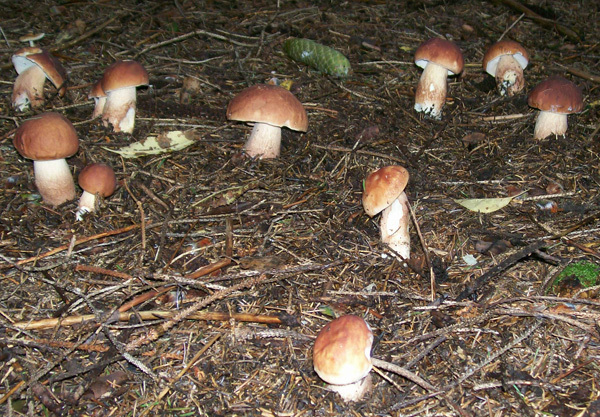 The Spring, Summer and Fall of 2011 were very good seasons for almost all mushrooms.